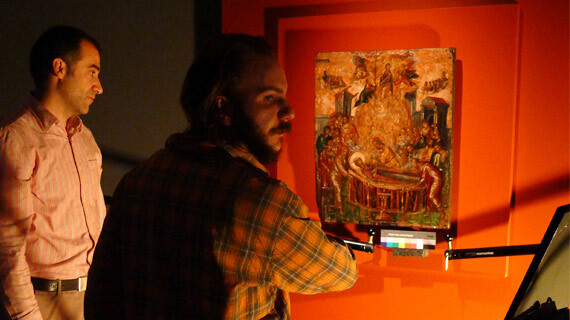 The CyI Imaging Center for Archaeology and Cultural Heritage (ICACH) applied Reflectance Transformation Imaging (RTI) photography on three celebrated paintings from the early career of Cretan artist Domenikos Theotokopoulos (1541-1614), known as El Greco during his illustrious career in Spain. Results have offered new, detailed evidence and valuable observations on El Greco’s work, technique and style during a transformative period for the Cretan artist. This project opportunity has underlined CyI’s expert contribution in the cross-disciplinary analysis of artistic heritage; as a result, ICACH will document other works by the artist in Athens and Crete and to participate in exhibitions and symposia organized in 2014, designated as El Greco Year. Application of RTI on El Greco paintings by ICACH is licensed under a Creative Commons Attribution-NonCommercial-NoDerivatives 4.0 International License.